A new class of high-performing organic molecules, inspired by vitamin B2, can safely store electricity from intermittent energy sources like solar and wind power in flow batteries, such as the one above. Engineers from Harvard University have identified a whole new class of high-performing organic molecules, inspired by vitamin B2, that can safely store electricity from intermittent energy sources such as solar and wind power in large batteries. 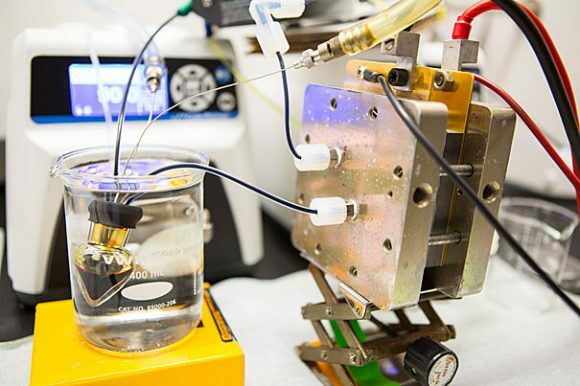 The development builds on previous work in which the team developed a high-capacity flow battery that stored energy in organic molecules called quinones, which store energy in plants and animals, and a food additive called ferrocyanide. That advance was a game-changer, delivering the first high-performance, nonflammable, nontoxic, noncorrosive, and low-cost chemicals that could enable large-scale, inexpensive electricity storage. While the versatile quinones showed great promise for flow batteries, Harvard researchers continued to explore other organic molecules in pursuit of even better performance. But finding that same versatility in other organic systems was challenging. The new research is published in Nature Energy. Flow batteries store energy from renewable sources in liquid tanks filled with non-toxic organic chemicals. Flow batteries store energy in solutions in external tanks — the bigger the tanks, the more energy they store. In 2014, Michael J. Aziz, the Gene and Tracy Sykes Professor of Materials and Energy Technologies at the Harvard John A. Paulson School of Engineering and Applied Sciences (SEAS), Roy Gordon, the Thomas Dudley Cabot Professor of Chemistry and Professor of Materials Science, Alán Aspuru-Guzik, professor of chemistry, and their team at Harvard replaced metal ions used as conventional battery electrolyte materials in acidic electrolytes with quinones. In 2015, they developed a quinone that could work in alkaline solutions alongside a common food additive. In this most recent research, the team found inspiration in vitamin B2, which helps store energy from food in the body. The key difference between B2 and quinones is that nitrogen atoms, instead of oxygen atoms, are involved in picking up and giving off electrons. The team will continue to explore quinones, as well as this new universe of molecules, in pursuit of a high-performing, long-lasting, and inexpensive flow battery. Harvard’s Office of Technology Development has been working closely with the research team to navigate the shifting complexities of the energy storage market and build relationships with companies well positioned to commercialize the new chemistries. Be the first to comment on "Engineers Reveal a ‘New Universe’ of Organic Molecules That Can Store Energy in Flow Batteries"